That’s a lot of… brightness. Or darkness. I’m not sure. Either way, I think there must be something wrong with the scale if LG can just increase contrast by a factor of 10. To be honest, I’m thinking it’s along the lines of the many Hz measure, which many TV makers are taking seriously these days. 120Hz? 240Hz? 600Hz like this one? Your eye can only really detect maybe 120. And the billion-to-one contrast ratio — if your numbers are in the billions, your number has ceased being useful. If, except for a minor “I guess that one looks a little better,” the average consumer cannot tell the difference between 10,000:1 and 100,000:1 contrast ratio, there’s something fishy going on. 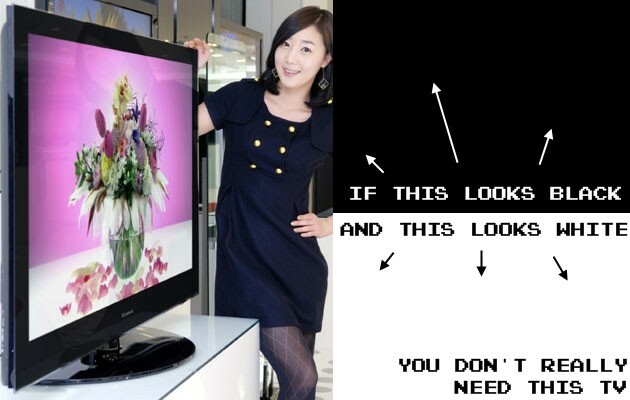 I’m sure this new TV from LG has excellent picture. It may even have one of the best pictures on the market! But the question is not its absolute quality but its relative quality. How much better is it than a TV half its price? How much benefit is there from having a billion to one contrast ratio, as opposed to a million or ten thousand to one? The same question goes to the Hz issue. Is the human eye even capable of perceiving the benefits? It’s getting out of control, people. Fortunately you and I can let the same suckers pay for 1,000,000,000:1 TVs as pay for $500 ethernet cables. They’re probably going to watch VHS tapes on them anyway.